Explain the term hot cracking & cold cracking in welding and how these can be taken care of ? Previous entry What is an equivalent length of column ? Next entry What is Firing Order of 4 and 6 Cylinder Engine? Hot weld cracking occurs at high temperatures—generally over 1000 degrees Fahrenheit (538 degrees Celsius)—and the defect appears more or less immediately (though not always visibly) upon solidification of the weld. Hot cracking is almost always appears in the longitudinal direction of the weld bead itself, or directly adjacent to it. Hot cracking can also appear intermittently along the weld’s length. Unlike hot cracking, cold weld cracking occurs at temperatures well below 600 degrees Fahrenheit (316 degrees Celsius) and does not appear until hours, even days, after the weld cools. Also, most cold cracking begins in the base metal instead of the weldment itself and passes transversely into the weld as it progresses. 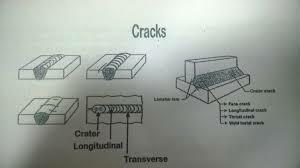 Cold cracking is often referred to as hydrogen-induced and/or heat-affected zone (HAZ) cracking.